One of the big issues we keep having is how to convey to our totally not technical users how technical parts work in #krita. For example, we notice a lot of people trying out animation want to do a full 1h 60fps movie inside Krita, which just isn&apos;t possible RAM wise. 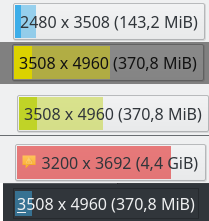 One way to solve this is education(users should proly use Krita together with kdenlive or something), but we can also try to improve Krita&apos;s memory reporting, by adding icons, for example. The issue however then becomes: What kind of rules of thumb are good to use (heuristics) and what kind of icons convey to the non-technical user to slow down a bit.